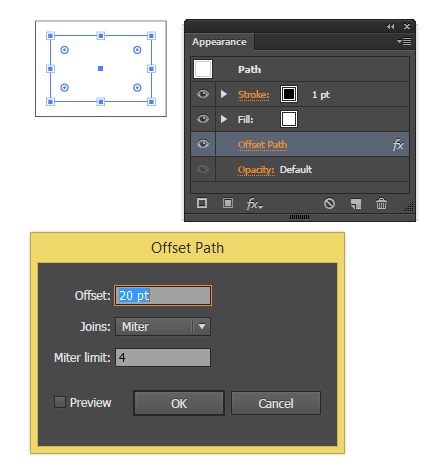 Scripting Adobe Illustrator is painful at times, we don’t have access to some of the most useful features available to us manually using the UI, and we also don’t have the luxury of major upgrades to the DOM as ID or PS users have enjoyed for years. With the release of CS6 some years back, Adobe surprised us with a couple of new, although undocumented commands that seemed to have great potential. One of them was executeMenuCommand(menuCommandString), the string syntax was missing, but fortunately it was quickly found out by some talented scripters, proving its value, and becoming one of the most, if not the most powerful command available. the important part of the string is the data, mlim is the MiterLimit Value “4”, ofst is the Offset Value “20”, jntp is the Join Type “2” for Miter. 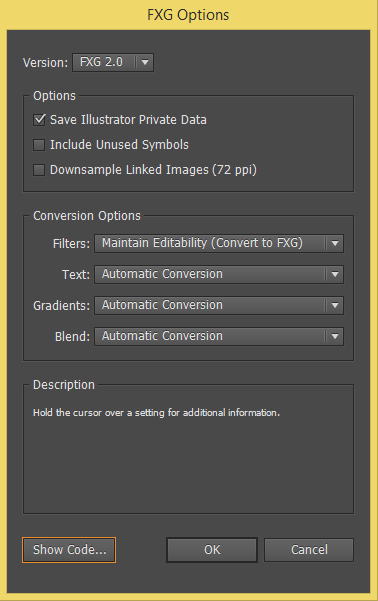 Make sure “Save Illustrator Private Data” is selected, then click on “Show Code…”, you’ll get the xfg text file generated. that’s all, that’s the xml string you need to add to your script. I would like to thank Adobe’s Sanjay Kumar, without his input this command would have not seen the light of day. I can’t tell you how valuable this info is! I never thought this would be possible.